I realize there are basically an infinite number of recipes for fried rice out there, but I promise this one is just a little bit different, so don’t let it get lost in the crowd. 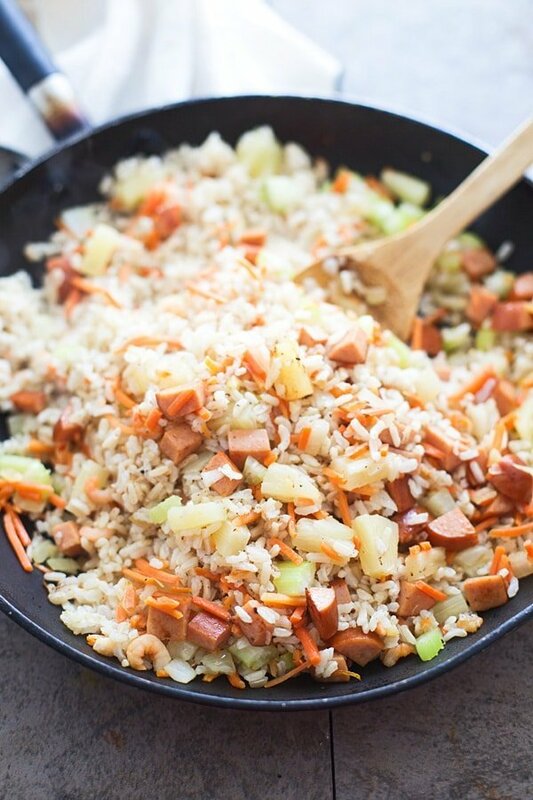 This version is unusual, not only because it’s lightened up a touch with the addition of brown rice, and the omission of a good amount of fat, but also because a couple of the ingredients aren’t common in your typical fried rice – hello Andouille sausage. And yes, a couple of ingredients can completely transform the end result of a recipe. For starters though, let me say that this is a copycat version of my very favorite fried rice from Kona Grill. Do you have one of those in your city?? It’s a chain Asian/American hybrid that happens to serve sushi, and while I’m not usually one for chain restaurants, this is a place I’d go to over and over and over again. Typically if I’m at a restaurant serving sushi, I don’t bother to even peruse over the entrée section of the menu. However, my first outing to Kona was long before my sushi loving days, so instead, I immediately skipped over the sushi and with a little input from my Mom who had been to the restaurant before, settled on a lunch portion of their fish tacos with pork and shrimp fried rice. The tacos were delicious – perfectly fried fish with a zesty slaw, spicy sauce, and a suitable amount of shredded cheese – but the fried rice was phenomenal. There were bits of carrot, onion, garlic and green onion like any other mediocre fried rice, but there were also small pieces of pork peppered throughout, an indiscernible ingredient that tasted sort of like soy sauce, but wasn’t, and teeny tiny shrimp in almost every bite I took. Oh, and there was also just a hint of sweetness from a little bit of pineapple. It wasn’t overly salty, spicy, sweet, or anything really, it was just good. I don’t know why it’s taken me this long to recreate it, but when the visuals for a Hawaiian chicken (coming later this week) started materializing in my head, I couldn’t get past the idea of it nestled on top of Kona’s fried rice. 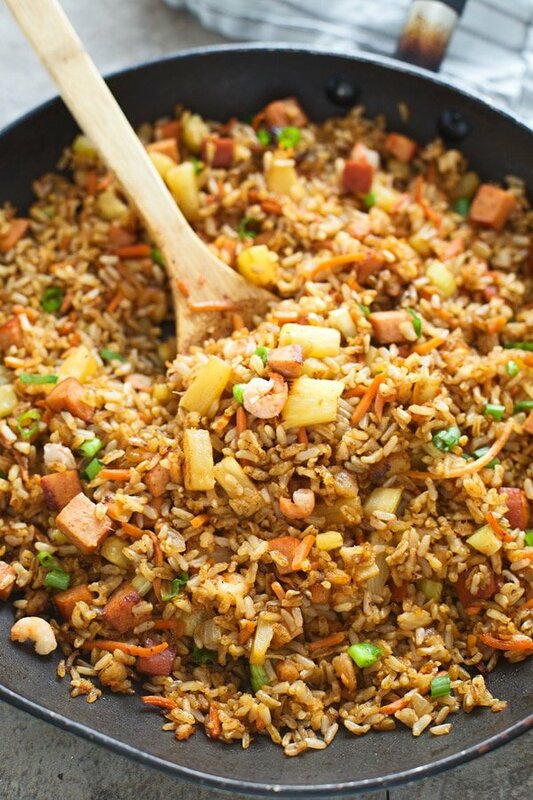 So I sought out the Internet to find a copycat version, because surely someone out there had the same feelings toward the fried rice as I did, and came up with a version I could make at home. Nothing. The only thing I came close to, was an ancient Yahoo Answers conversation of another person in my situation who wanted to know how to make it, and luckily got some insider information from the restaurant, which helped shape my recipe into what it is today. 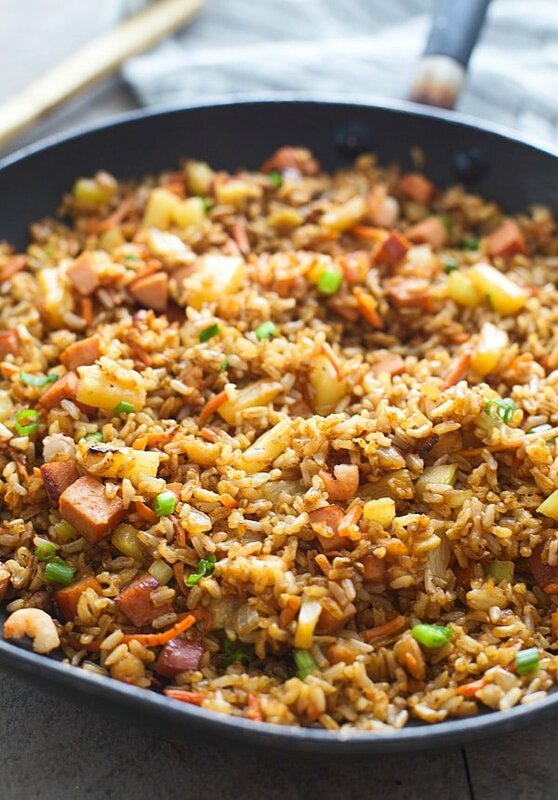 Most of the ingredients weren’t a big shocker, but there were two that don’t norm ally make an appearance in fried rice – oyster sauce and Andouille sausage. The oyster sauce isn’t a total surprise, I mean, it’s a pretty classic Asian condiment, but the Andouille sausage really threw me for a loop. Turns out, it’s essential to mimic the flavor of the restaurant’s original version, because with it, I think I came pretty darn close to hitting the nail right on the head. 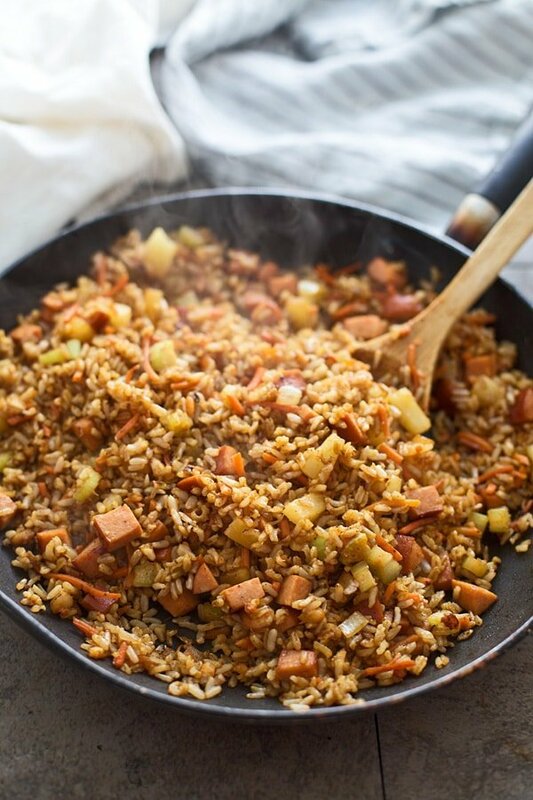 As most fried rice recipes go, you begin by stir-frying a little bit of onion, garlic, ginger, carrot, and celery in some screaming hot peanut oil. From there the veggies come out, and the pineapple and sausage go in to caramelize a bit in the oil. The pineapple and sausage come out, and the rice goes in to fry and crisp up. Everything along with the baby shrimp goes back in to the hot skillet, and a sauce of tamari, pineapple juice, oyster sauce, sesame oil, and rice vinegar is poured over, it’s tossed a few times, sprinkled with green onion and it’s ready to be served. This is meant to be a side, but it’s PLENTY to feed to two people for dinner. Rinse rice under cold water for 30 seconds. Add rice and water to a rice cooker. Set to brown rice and cook until fluffy. Or, if you don't have a rice cooker, cook rice according to package instructions. Cool rice completely. I like to spread the cooked rice on a baking sheet and pop in to the fridge to blast chill. You want the rice to be cold when you cook it. You can do this the day before, or earlier in the day to save time. Whisk sesame oil, tamari,oyster sauce, 1 Tlbs. pineapple juice from canned pineapple, and rice vinegar together in a small bowl. Set aside. Heat a large non-stick skillet or seasoned wok to a high heat. Add one teaspoon of oil. Add onion, garlic, shredded carrot, celery, and ginger. Stir-fry with a spatula until slightly softened, about 2 minutes. Transfer to a plate. Add another teaspoon of oil to skillet or wok. Add pineapple and chopped sausage. Stir-fry with a spatula until caramelized, about 30 seconds to one minute. 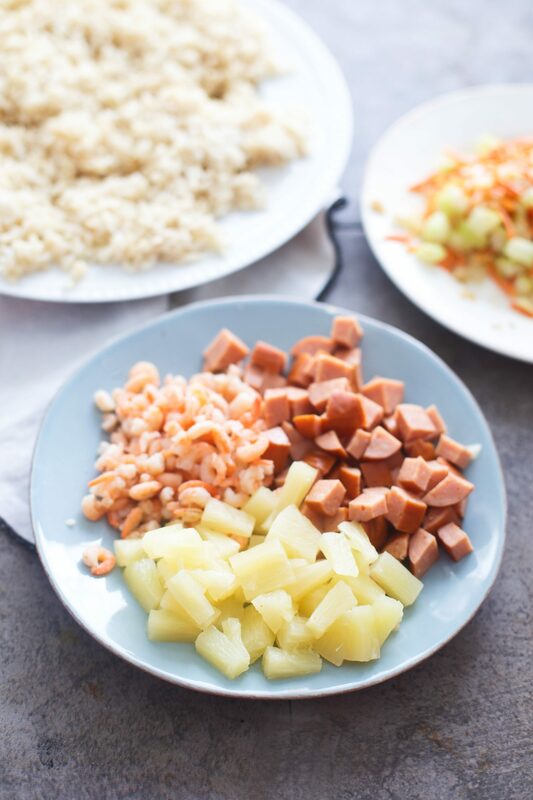 Transfer pineapple and sausage to the same plate with veggies. Add remaining oil to pan, add cooled rice. Stir-fry with a spatula for 1-2 minutes until hot and rice is started to crisp up. Add veggies, pineapple, sausage, and shrimp back to the pan with the rice. Stir-fry 30 seconds to 1 minute or until everything is incorporated. Add sauce. Continue to toss with the rice with the spatula until he sauce has fully cooked in to the rice. Add green onion, toss. Season to taste with salt and pepper. To save time, buy 3 cups of cooked brown rice from your local Chinese carryout restaurant. White rice can be substituted. Serve with this Hawaiian Chicken! 27 Responses to "Copycat Kona Grill Fried Rice (AKA The BEST fried rice)"
I’ve never heard of Kona Grill …. but I LOVE fried rice of any kind! I make it at home fairly often – must try this!! It’s such an easy dinner! Going to have to give this a try! Can’t go wrong with fried rice IMO. I agree, you can never go wrong with fried rice! I’ve never heard of Kona Grill either but you’re making me want to find one ASAP! This looks delicious and I love the healthier swap of brown rice! How do you think this one would work with quonoa? I think it would work great with quinoa! Which brand of oyster sauce do you use? Ahhh, I’m not sure! I will get back to you! You’re missing an ingredient. Chinese sausage. It’s made from pork and is sweet. This is a specialty item found in Chinese markets.